I’ll confess…I’m a dyed-in-the-wool fan of blued steel and fine walnut. All of the outdoor magazines had photos of guys in Alaska and Africa with Model 70’s and 700’s. Some of the blueing was worn completely off and the stocks wore the dings and scratches of a lifetime of hunting adventure. I’ve worn the bluing off a couple of my favorite rifles and banged up wooden stocks far more than they deserve. Today you’re likely to find me toting a “dishwasher gun”…composite stock and stainless steel in the whitetail woods and the wilderness elk call home. But you’ll also find me plinking and sniping at the occasional ground squirrel with an AR-style .22 Long Rifle. Browsing along in one of the local gun shops I see a couple of AR rifles up on the wall that is .22 caliber. One says “Genuine Colt” on the placard. I ask to see the gun. Sure enough, there’s the Colt logo. It says manufactured by Walther on the lower receiver. 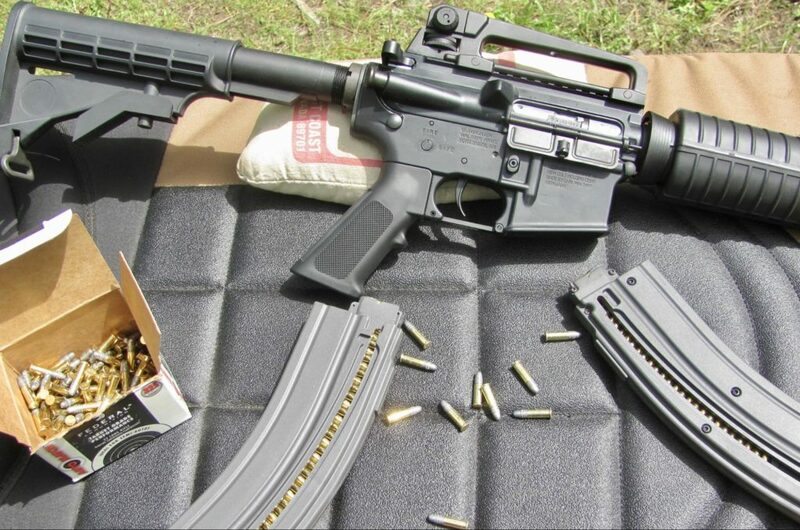 Read on for my full review of the Colt M4 in .22LR plus some other options for a .22LR AR-15. It’s all metal. The only other AR .22 I’d ever seen or handled was an S&W M&P 15 22. Cool little gun, but it felt awfully light and was mostly polymer. I told the sales guy to get the box and throw in three additional mags and a box of Federal AutoMatch. Previously I’d researched .22 uppers for my AR and conversion kits but never really felt comfortable with either option. I really liked the idea of a dedicated .22 for plinking and training that had identical controls and handling characteristics and could be run for far less than the cost of .223 ammo. 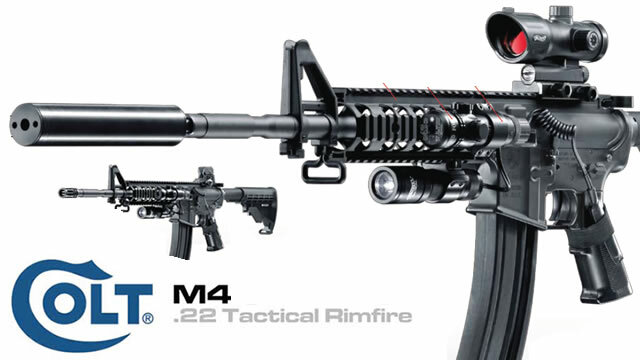 In 2009 both Smith and Wesson and Colt (Umarex) introduced their dedicated .22 Long Rifle AR platforms. The rifle I selected is a Colt M4 Carbine manufactured by Walther. Looking at it, the Colt M4 Carbine is simple and doesn’t scream “.22 LR PLINKER”. Sporting a 16” Parkerized M4 pattern barrel with flash hider and an anodized aluminum upper and lower. The front sight fixture is all metal with elevation adjustable front sight post and a bayonet lug if you are so inclined. The Carbine has a traditional forend with no rails or slots for accessory mounting. 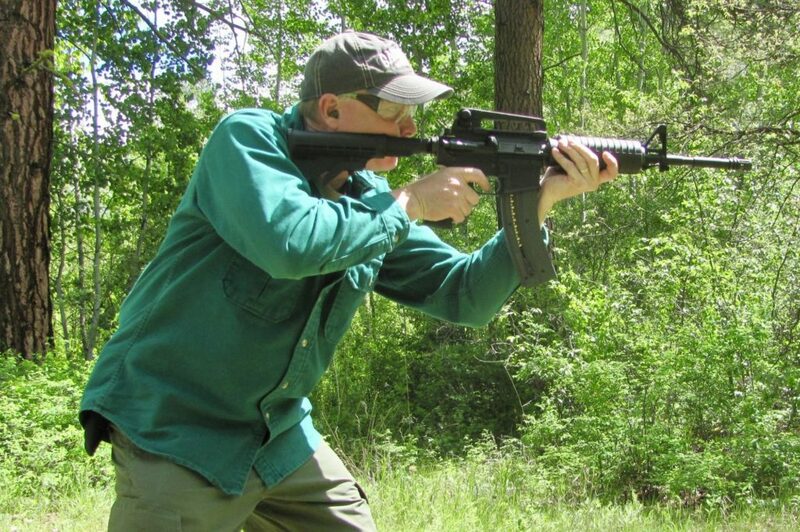 The buttstock is a 5-position sliding affair common to most AR’s today. Up top is a traditional removable carry handle with an A2 adjustable sight assembly. Under the carry handle is the flat-top Picatinny rail for mounting scopes, red-dots or other sighting accessories. 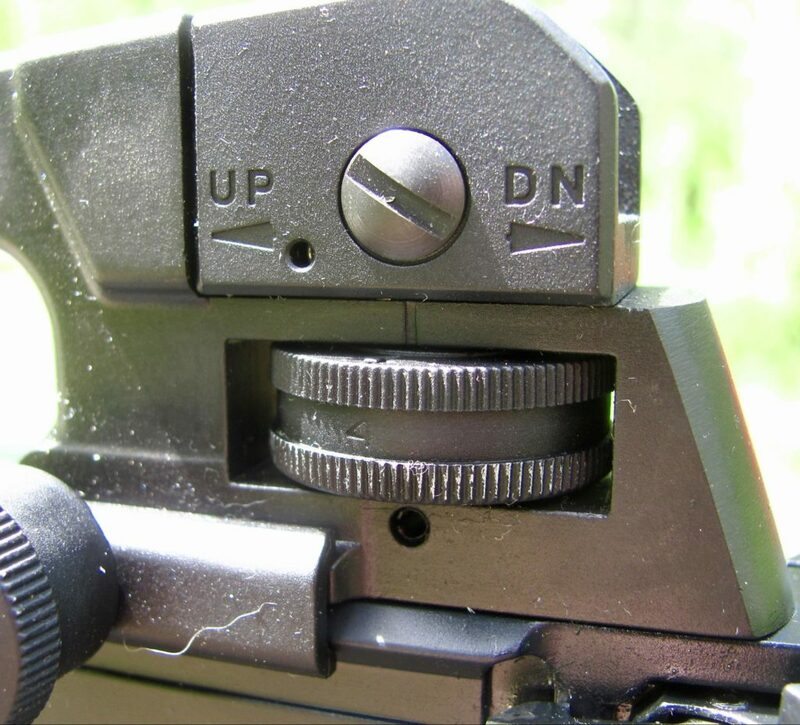 Classic rear sight, simple and effective! You will also find a forward assist button that moves but doesn’t serve any function on the rifle. It is strictly to keep the rifle as close to AR platforms as possible and serve as a training tool. 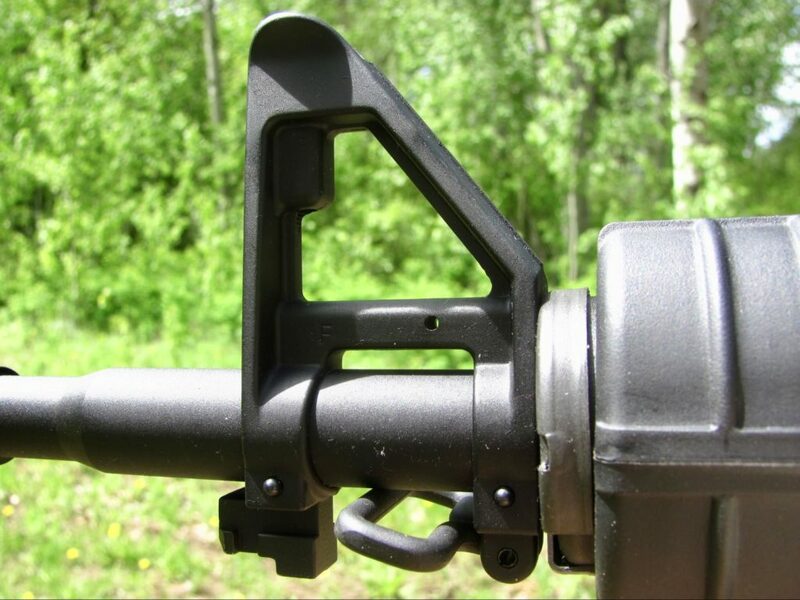 Likewise, the bolt release on the left side of the magazine well doesn’t serve any function; it is molded in, but the bolt only closes from a locked open position when the charging handle is pulled back and released. The trigger is OK. My trigger scale showed a bit over 8lb for an average. There is a bit of taking up, then a pretty hard pull, and a bit of overtravel. It is not the best for shooting precision groups from the bench, but then again – neither is the M4 Carbine. The reset is pretty easily felt and as you shoot the gun in drills your split times continue to get better as you get a feel for the trigger. Those familiar with AR’s are used to removing the rear pin and pivoting the upper away from the lower and removing the charging handle and bolt carrier group to clean the rifle. On the M4 .22 Carbine, you do not remove the bolt or anything but the charging handle. At the very top of the “bolt” is a hex bolt that allows you to adjust the bolt speed depending on the ammo you are using. I have never touched the factory adjustment and have never had any issues with the ammo I have used so far. Magazines are available in 30-round, 20-round, and 10-round configurations. It is very difficult to shoot from a bench with a 30-round mag. I found myself loading one round, removing the magazine, then firing and reinserting and loading the next round when shooting for accuracy. If you are going to use the rifle for small game hunting be sure to check the game laws regarding magazine capacity before you head to the field. The little rifle is fun to shoot. And it will unload a box of .22 Long Rifle in short order. I have deliberately left my Rock River AR bone stock. No optics, no lights. Just a fully functional defensive rifle. Likewise, I have never seen the need to put an optic on my .22 Carbine. But to satisfy my curiosity I mounted an old Weaver scope I had in the safe and fired a few groups at 50 yards to see what accuracy the rifle is capable of. Trying to manage the trigger and a too long magazine was frustrating, to say the least. Once I began single loading, the groups tightened up. On average the gun produces groups of about 1 3/8”. However, one group measured only 7/16”. All groups were fired using Federal AutoMatch .22 Long Rifle. “Tactical Rimfire”…for training, and when the squirrel army attacks. With open sights at 50 yards, I managed groups averaging 1 1/4”. The rifle will obviously shoot and by testing additional ammo will probably turn in much smaller average groups when I find a bullet and load it really likes. I also brought my targets up to 10 yards and did a few runs shooting on silhouette targets. Because I had only two target stands available I opted to shoot 2 shots to the head, 2 shots to the heart/chest. Then transition to the next target and do the same. As I went through the drills my speeds increased and my groups for several runs became consistently smaller. My groups for the head and chest on both targets on my last three runs were about 3”, combined. In all my range testing and all the rounds my nieces and nephews have run through this rifle I have had no failures of any kind. The rifle exhibits good accuracy as it is packaged. I believe with a better trigger and a better scope than I had available, groups would shrink considerably. With the open sights, a narrower front sight post would aid in finer aiming and smaller group size. This is an AR platform and as such, it is very easy to shoot and manipulate the controls. The weight is similar to an AR carbine and therefore it is a very good option as a training rifle using much less expensive ammo. Again, it’s an AR. This one is stock and has no fancy rails to hang stuff on, but it matches my AR carbine nearly exactly. It is flat black and looks all business as a defensive rifle should. The AR/Modern Sporting Rifle fairly screams “customize me!” This rifle is no different. You can change the forend, the grip, the buttstock. Mount an optic of your choice. Put a fold-down BUIS on the rear. Change the forend and hang lights, lasers and whatever your heart desires on rails or other mounting systems. I paid $279 for my rifle. Current retail is about $299-400. Magazines retail for $29.99. Compared to the cost of an AR in .223 the AR .22 is a bargain and provides hours of inexpensive plinking and training fun. The Colt M4 .22 Carbine is a great gun for training, learning the ropes of AR platforms, teaching new shooters and having fun at the range. 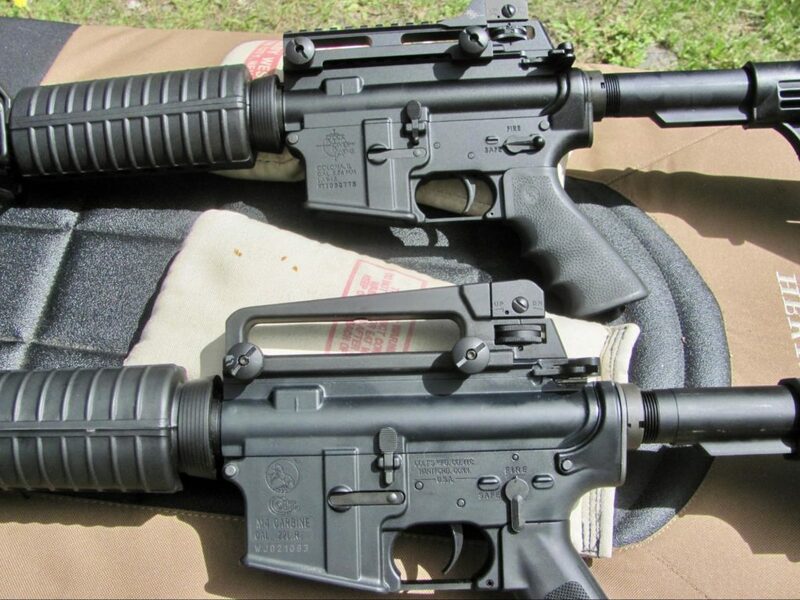 As mentioned earlier, the Smith and Wesson M&P 15-22 launched the same year as the Colt M4 .22 Carbine. The Smith and Wesson is a fine AR platform .22 Long Rifle option for shooters and is currently available in 15 variations. Smith & Wesson learned quickly that the little .22 rifles that shared the same trigger group as their .223 AR counterparts and field stripped in the same manner were selling as fast as the centerfire models. With a few different features than the Colt reviewed above, the S&W offerings feature a polymer upper and lower and as such weigh a bit less at 4# 13 oz. The M&P 15-22 is an understudy to the centerfire AR’s S&W builds so the controls are predictably the same as the vast majority of AR-15’s. While there is no forward assist button on the Smith and Wesson and the bolt release button is fully functional. Magazines are available in 10-round or 25-round models. 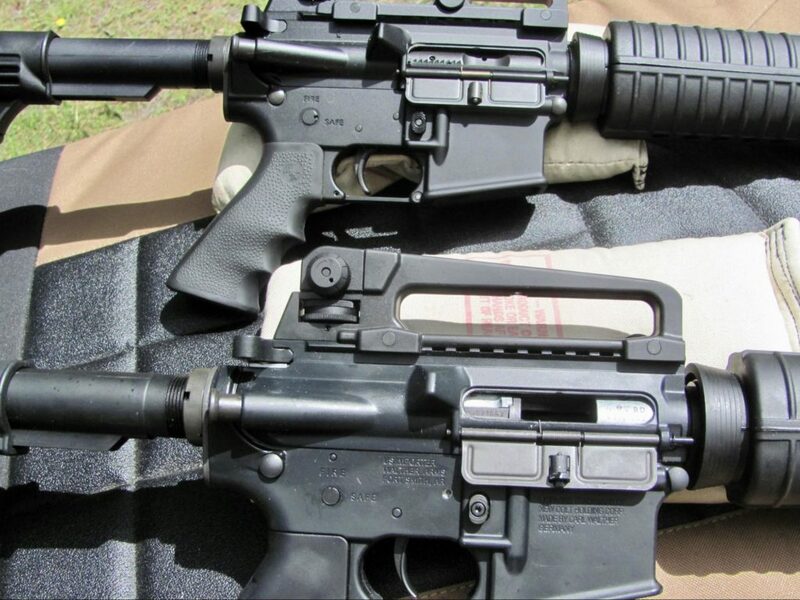 The S&W M&P 15-22’s are supplied with Magpul MLOK forends, 6-position buttstock, and Magpul MBUS folding sights. This gives you a lot of options for optics, lasers and lights to customize your rifle for your needs. For all your plinking and training needs any of the S&W M&P 15-22 variations will serve you well. CMMG is probably best known for its conversion kits and upper, but they also supply rifles in .22 Long Rifle. The Mk4le is the basic model and features an M4 profile 16” barrel, front sight, forged upper and lower, 6-position buttstock, and MBUS rear sight. The rifle weighs 6.2 pounds. Magazines are available in 10-round and 25-round capacity. I think you can see a theme here, mostly the AR-15s in .22 LR are rough as homogenized as standard caliber AR-15s. But there are still differences in price, quality, and roll mark. As mentioned above, when one thinks about using their existing AR platform to shoot .22 Long Rifle, CMMG is often the first option that comes up in an internet search. The Bravo kit consists of a stainless bolt carrier conversion and a 25-round magazine, you can often find these on sale at Brownells. Simply remove your bolt carrier group from your upper, insert the CMMG conversion kit, load the mag and go. All in all, for a budget-friendly way to shoot and train with your AR the CMMG conversion kits offer a lot of bang for the buck. Finally, CMMG and a host of other manufacturers offer dedicated .22 Long Rifle uppers to mate to your AR lower for low-priced plinking and training. PSA is well known for their quality and budget-minded AR-15s, AR-10s, and AK-47s – and this dedicated .22 LR upper is no different! For the money, it’s a great way to turn any AR-15 into a plinking king or make training with your standard rifle a lot cheaper. It comes fully ready for the range with a dedicated .22 LR barrel, BCG, and Charging handle. The Mk4le upper is identical to the full rifle offering with the exception that no rear sight is supplied. You simply remove your .223 upper, pin on the .22 Long Rifle upper, load up your magazines and hit the range. With a dedicated upper you will likely see an improvement in accuracy because the barrel is specifically bored and rifled for .22 Long Rifle bullets. A .223 bullet is actually .224” in diameter whereas the .22 Long Rifle is .223”. 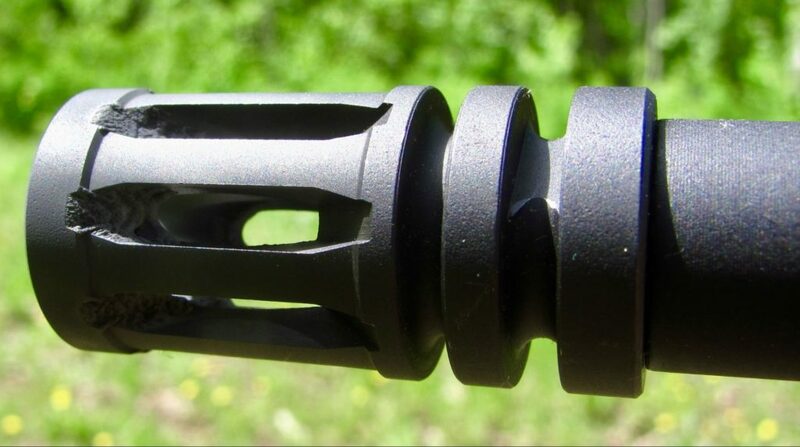 In some AR barrels, you may not get quite the accuracy because of the bore diameter and twist rate. But with a .223” bore and the slower twist specified for .22 Long Rifle you will likely see much tighter groups. Hopefully, this glimpse into the world of .22 Long Rifle AR’s gives you some ideas on your options. From fully dedicated rifles to conversion kits to uppers, there is a way for everyone to get more practice and training with their AR platforms. Regardless the option or options you choose, get out there and have some fun shooting your .22. If you’re looking for more great AR-15 information, check out our Definitive Resource! What about you? Do you train with .22 LR? What kind? Let us know in the comments! Would you use a CMMG conversion kit on your AR15 self defense rifle for practice? Would you have concerns about messing up your self defense rifle? Is there a concern about .22LR fouling the gas port? Is there a concern about .22LR fouling/leading the barrel? What about the Kriss DMK 22? I did plenty of research and finally settled with the Tipmann M4 22 lr. Other than propriety mags which aren’t cheap- everything I read gave me confidence that for the money I was getting the best/more realistic AR trainer rifle available. Thoughts? I have owned the S&W 22 version since they were introduced. I installed a 4 pound Timney trigger, (3.5 will NOT work) and all Magpul furniture. The gun is awesome. It likes CCI MiniMags, and CCI Tactical, but Eley force just knocks the accuracy out of the ball park. It carries a Vortex 3×9 scope. I shoot it frequently. I truly enjoy this rifle. Well, this is an article on the “Best AR-15 in .22”, and the 522 isn’t an AR-15 in .22, so….